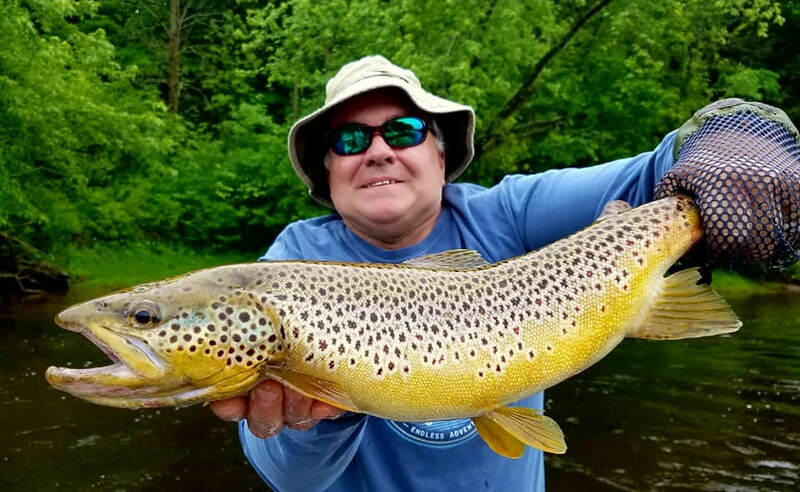 Mike with another nice hen taken on a Mojo sac fry. 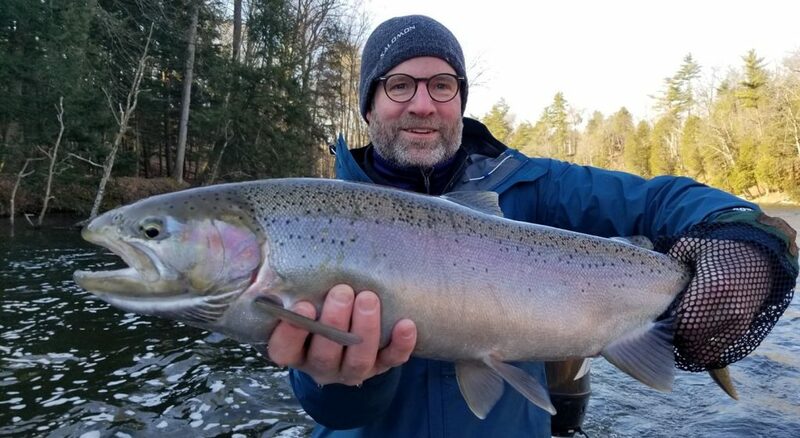 Fly fishing seems to be working well over the past several day. 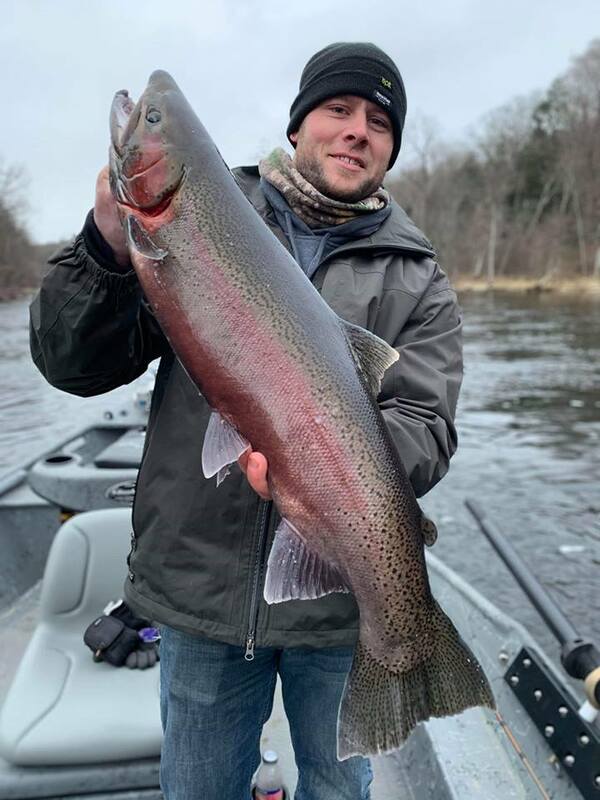 Muskegon River fishing continues to be very good with lots of steelhead in the lower river below Newaygo. 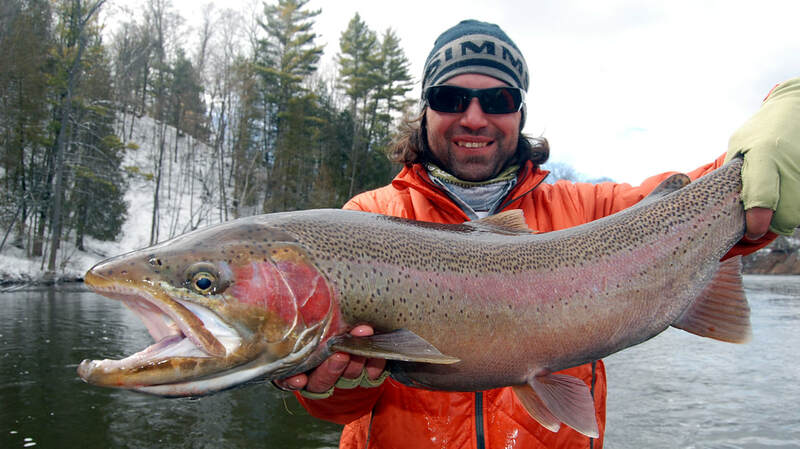 Fish are on the move with the longer daylight and perfect water flows. 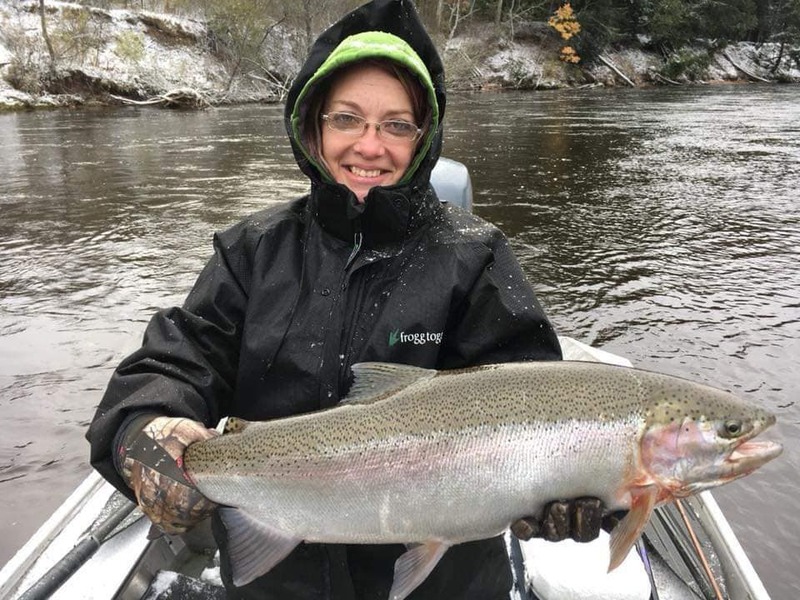 Come fish the Muskegon River and make some memories! We are now offering MORNING HALF DAY TRIPS for March and April. 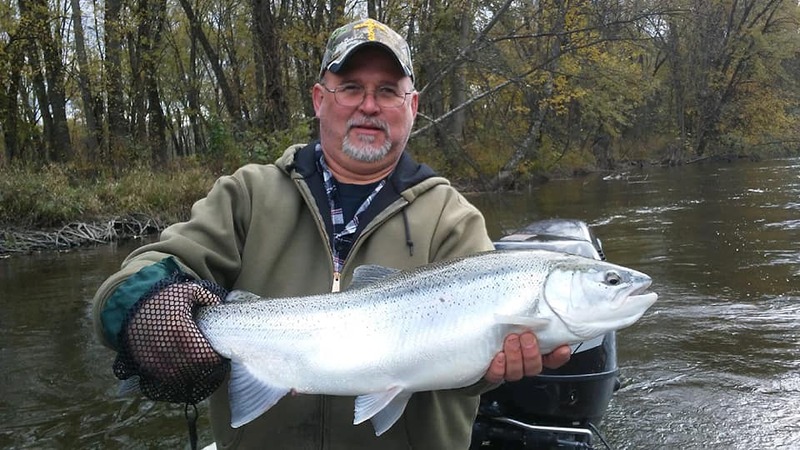 Starting to see some steelhead beginning to spawn in the upper sections near Thornapple and surrounding gravel areas. 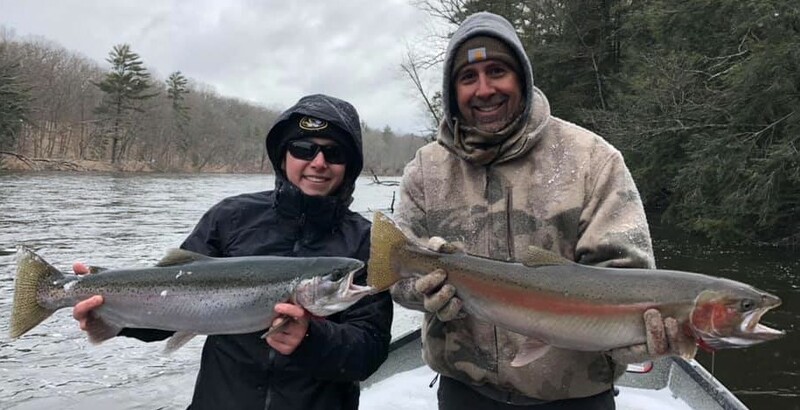 Despite the cold water temperatures, steelhead are on a biological time clock based on time of year, and length of daylight. Some of our focus has been deep holes in close proximity to gravel. On certain days, free style nymphing deep water has produced excellent results. 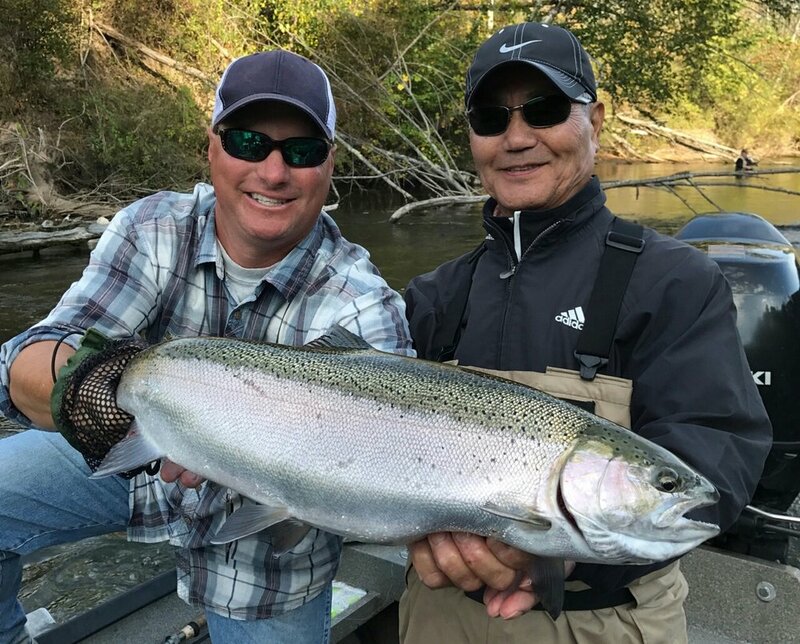 (Ed & Jared had an awesome day of fly fishing, landing five beautiful steelhead, and many chunky trout!) Muskegon River Center pin trips. Quite a day it was! We fished hard, covered water, and made a lot of casts. 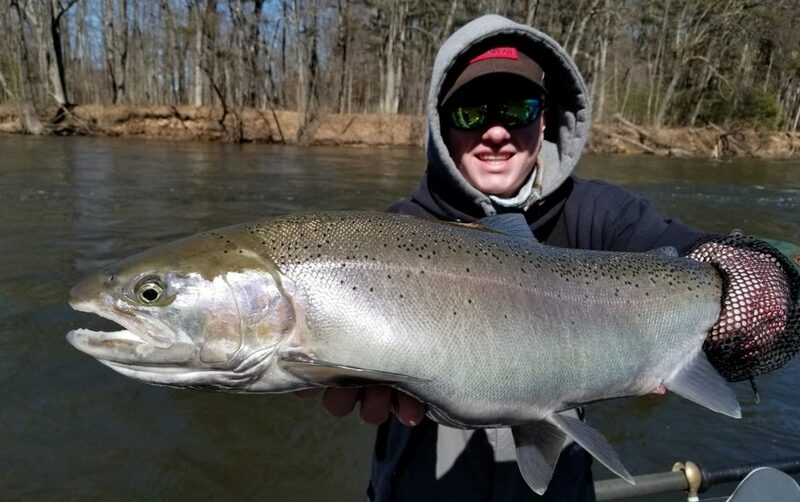 Well worth the efforts to land a lot of chromers! 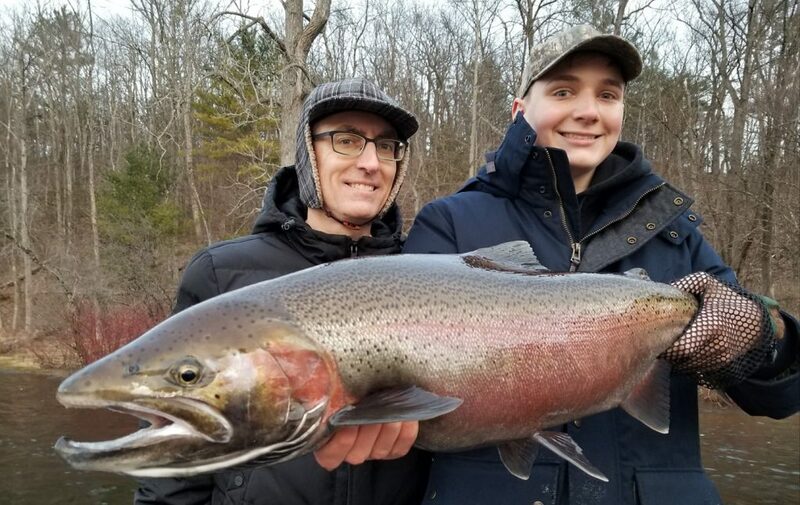 Joe landed his first steelhead! Scott with a chromer. 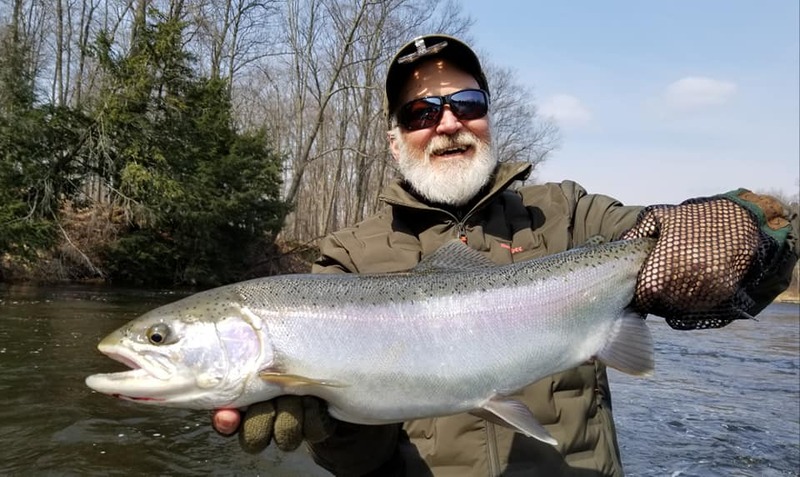 Starting to see the main push of Spring Steelhead in the upper sections of the Muskegon River. Prime Time is here! 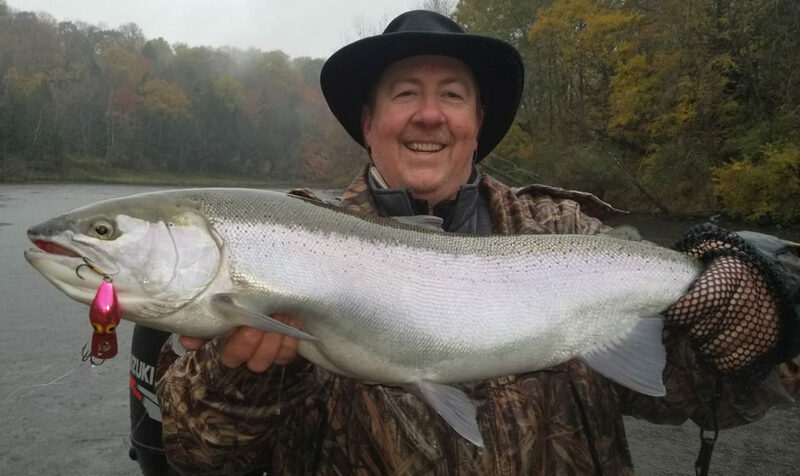 Michigan Steelhead Fishing Reports for Great Lakes Steelhead. 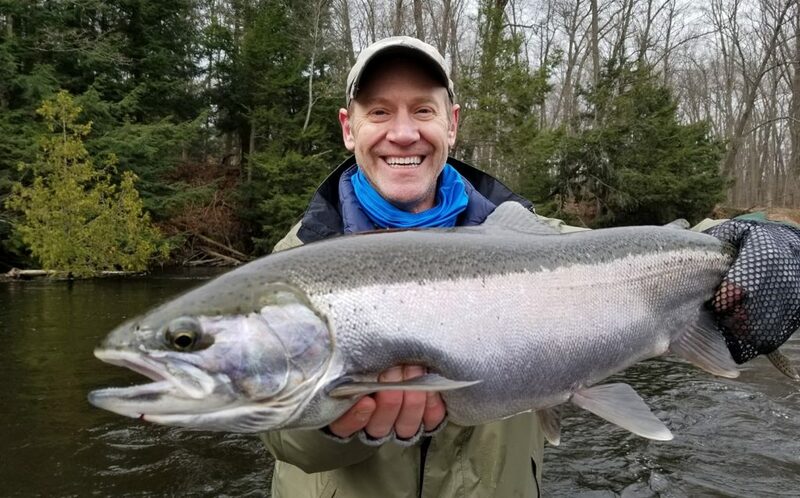 You definitely wouldn’t know it with the weather lately but, right now we are finally heading into the peak of the Michigan Spring Steelhead season on the Muskegon River. Both the Big Manistee River below Tippy, and the Muskegon River below Croton dam are fishing rock star now for steelhead. 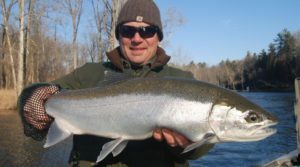 Good numbers of both winter and spring steelhead are spawning. Water temperatures have finally hit the magic 40 degree mark. We’re starting to see a lot of fish on gravel. 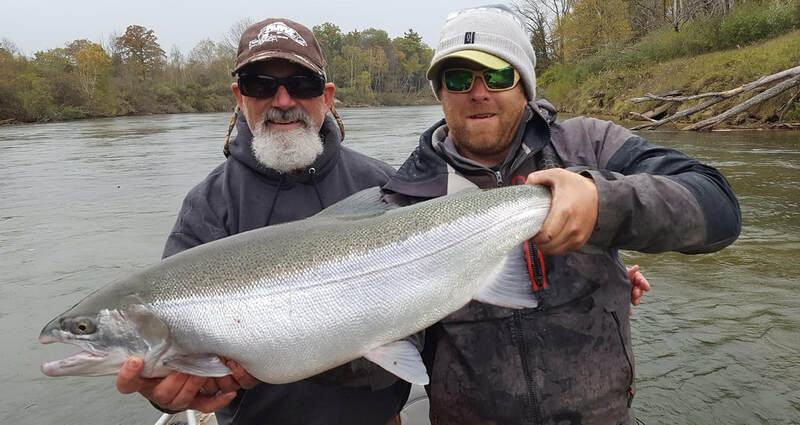 Look for a lot more spring steelhead to show up during our next significant rain fall. 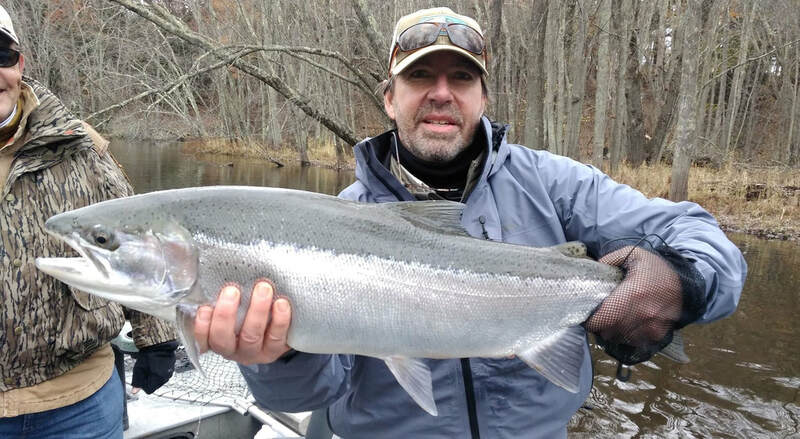 There’s a good number of steelhead still in the lower section that are ready to push into the upper river. Coming soon! Eric with a colorful buck. 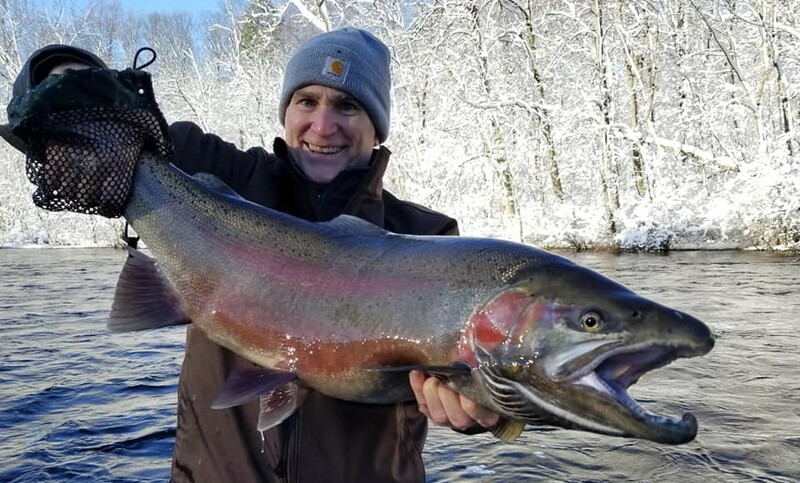 Fishing is on fire right now! Next week should be peak week! Bright Chrome hens! 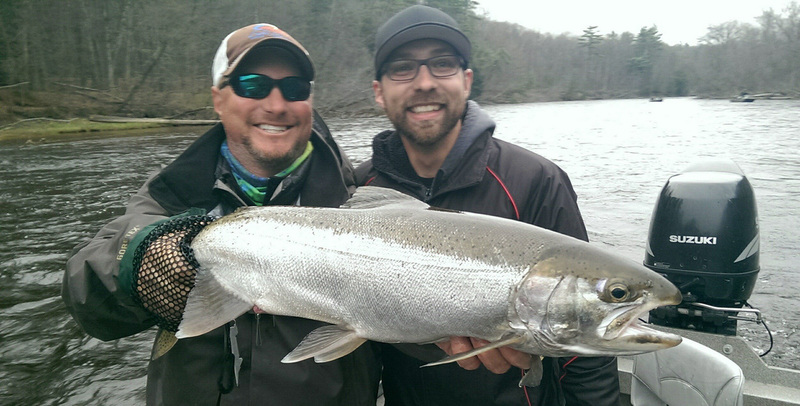 Lots of Steelhead starting to hit gravel and spawn! 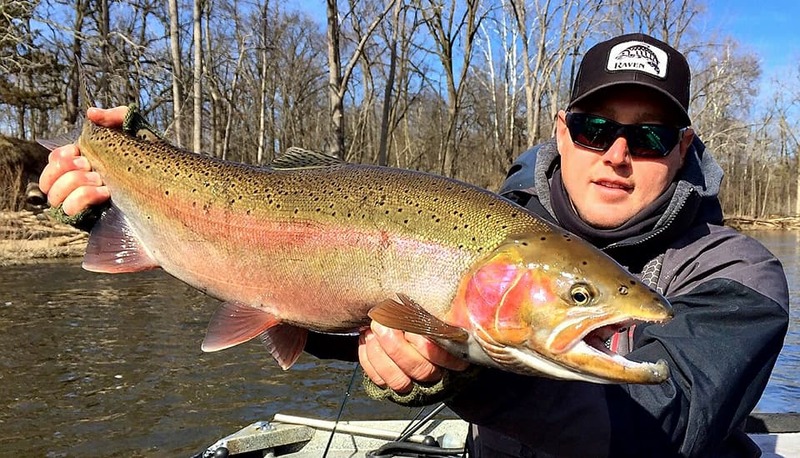 Spring Steelhead are here. 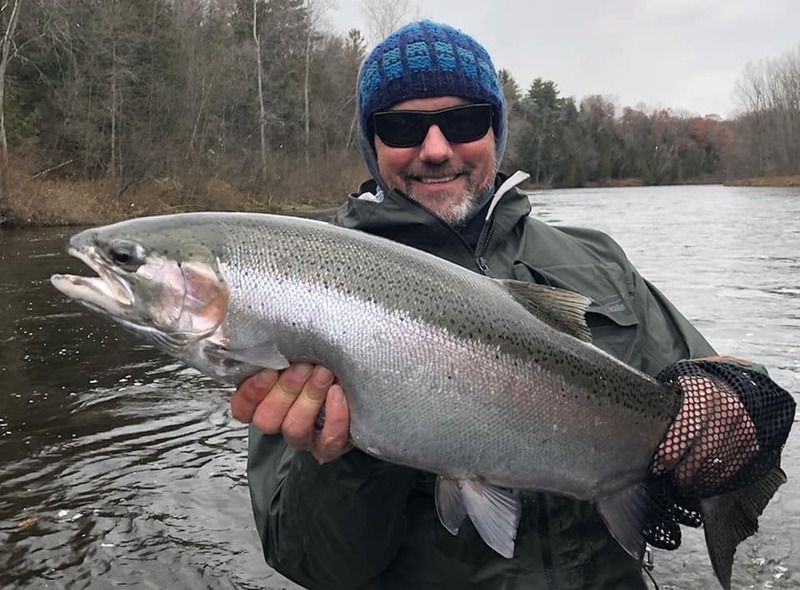 Michigan Steelhead Fishing Reports for the Muskegon River. 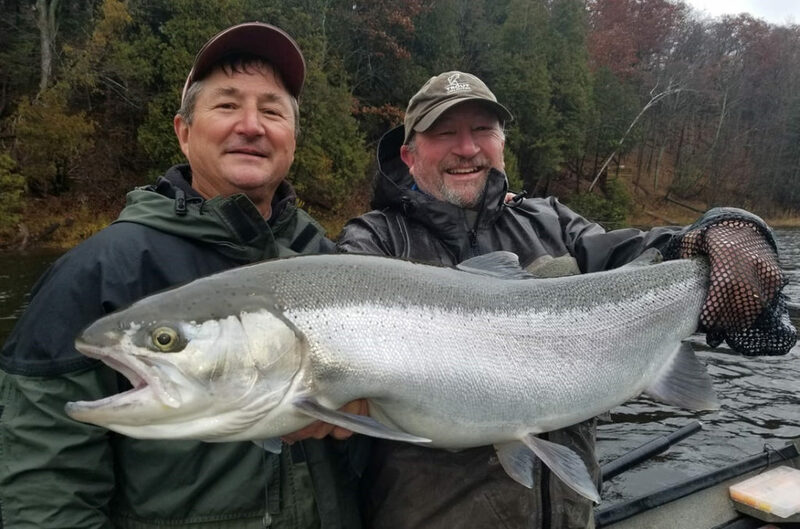 Steelhead fishing on the Muskegon River is now in full swing!! 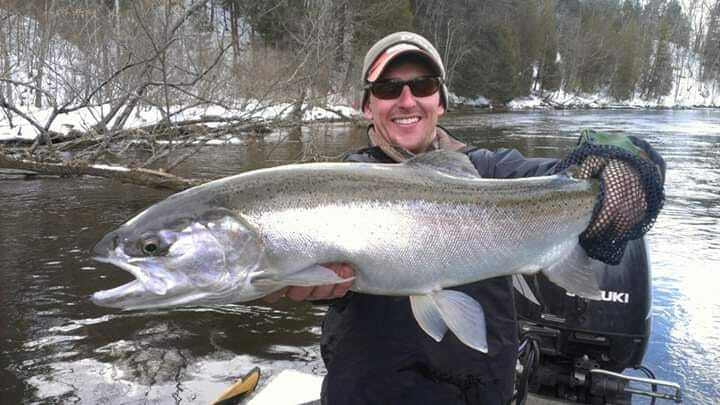 Good numbers of steelhead in the upper river with a fair number beginning to spawn. 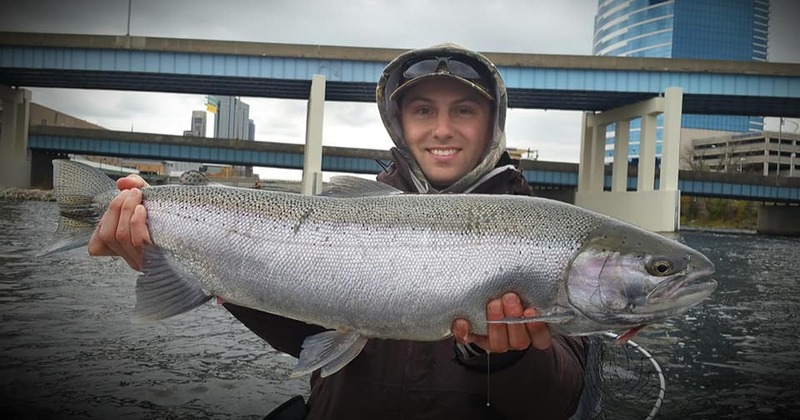 Water levels and temperatures are perfect for the bite, and I think the DNR is finished shocking walleye for this week. River conditions look favorable over the next week or so. 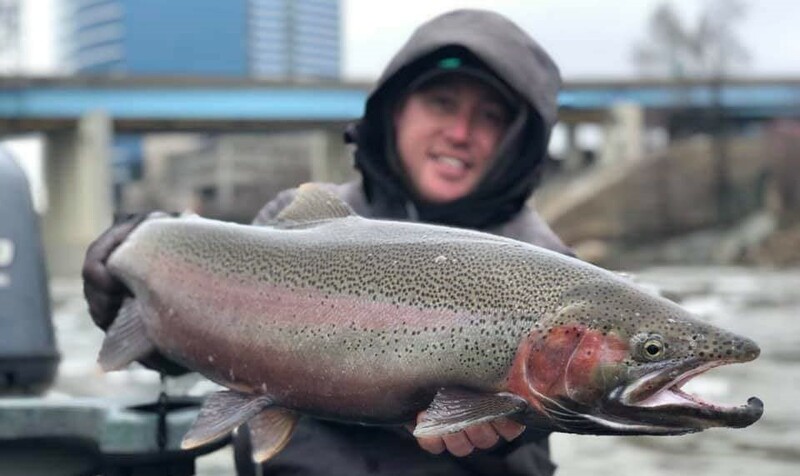 Fishing is phenomenal right now and it should stay that way for awhile. 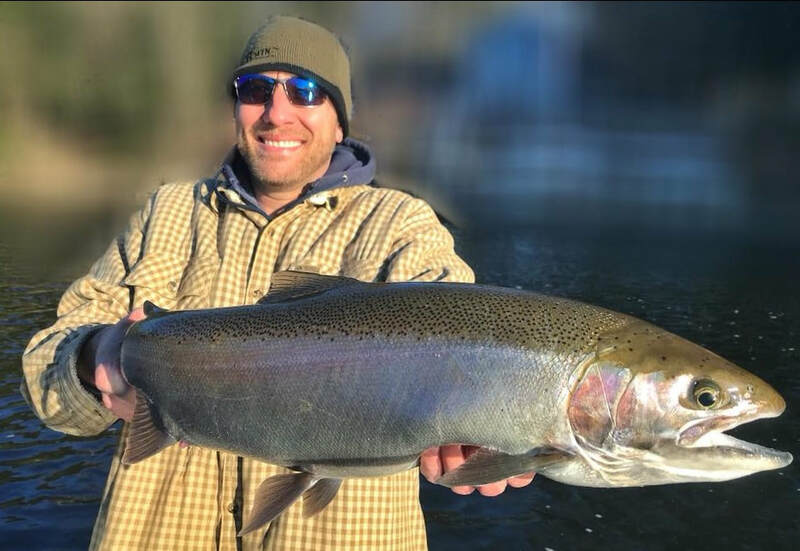 Best Steelhead fishing techniques for Spring Steelhead: Float fishing (bobber) with trout beads or jigs tipped with wax worms. Fly fishing to fish on gravel is going strong. 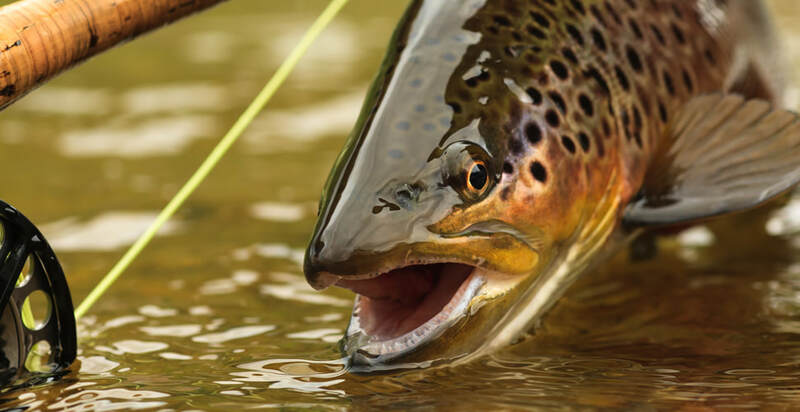 Dull colored flies, stone flies, hexes, and green caddis are all putting fish in the net. 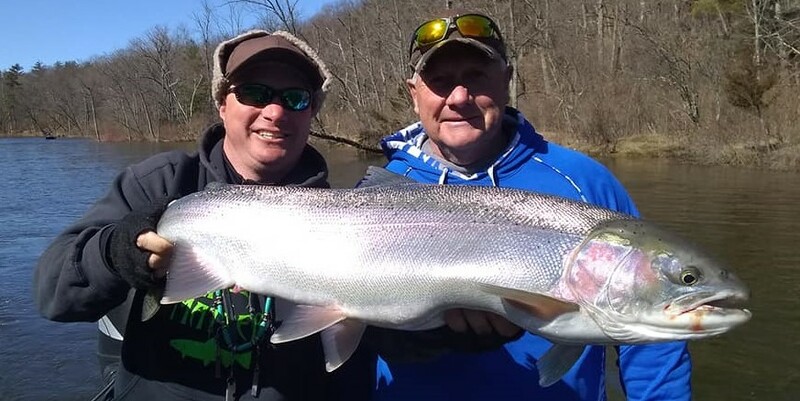 Best Steelhead fly patterns Casting small crank baits has also been working well. 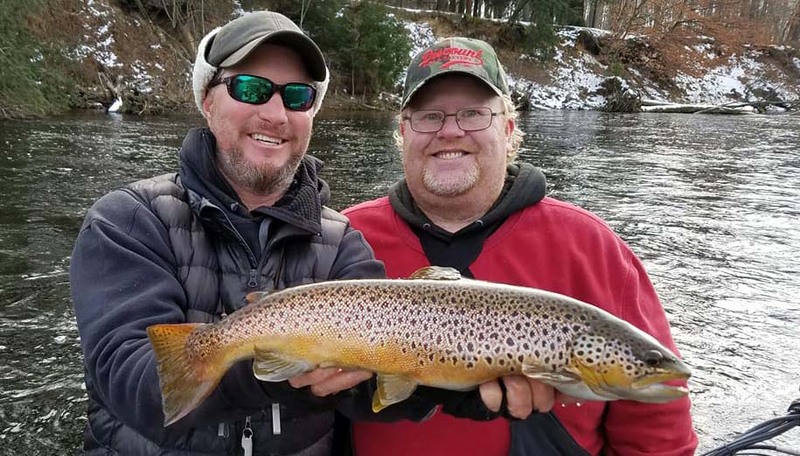 White River Trout Fishing Report Click here to Book Now. Emily with a gorgeous hen. Fishing is outstanding right now! 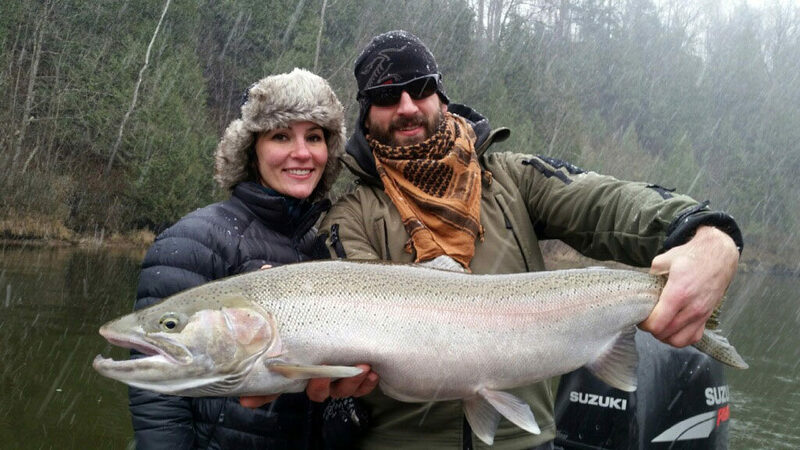 Matt and Emily has some really good fishing. Afternoon’s are also fishing well.